UNITED NATIONS (AP) — A top Palestinian official said Wednesday that President Mahmoud Abbas would accept no political delays on his bid for membership in the United Nations, rejecting mounting pressure from the United States and France to first return to negotiations with Israel. The Palestinians plan to submit their letter of application on Friday when Abbas is to speak to the U.N. General Assembly, but he faced a withering lack of support as the world body opened its annual meeting. President Barack Obama said there could be no “shortcuts” in the quest for Middle East peace, a message that was echoed by French President Nicolas Sarkozy. “We will not allow any political manoeuvring on this issue,” said Saeb Erekat, a senior aide to Abbas and former chief of negotiations. Erekat said Abbas had made that plain in discussions with all parties involved over the last three days of meetings in the lead-up to the annual UN global gathering of presidents, heads of state and ruling royalty. Sarkozy proposed a one-year timetable Wednesday for Israel and the Palestinians to reach a peace accord, part of a concerted push with the United States to steer the Palestinians away from an application for U.N. membership. Sarkozy spoke shortly after Obama warned against action on the Palestinian bid before there was a peace agreement. He said negotiations, not U.N. declarations, were essential to a lasting peace. While Obama stopped short of calling directly for the Palestinians to drop their bid for full membership – an effort the U.S. has vowed to veto in the Security Council – Sarkozy sounded a more compromising tone and urged each side, and the international community, to approach the deadlocked process with new ideas and tactics. via Daily Record | Morris County NJ | AP Wire. 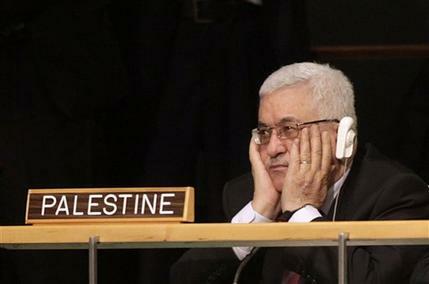 So the Palestinians will not accept a delayed vote. They will DICTATE this requirement to the U.N.? This is ridiculous. They have no authority to tell the U.N. what they must do. Is there an implied threat? “Give us what we want or we will go to war.” This entire United Nations event is simply another behavior problem. Like Khrushchev and Arafat they think they can boss the world. Israel, with a population of less than 8 million people, in an area the size of New Jersey must confront huge nations with money and manpower. Other than the United States they have no one to turn to for support. How sad our world is.